Since 2003, Level 5 Partners (L5P) has been aiding clients in increasing efficiency and reducing costs by focusing on business and delivery performance issues. 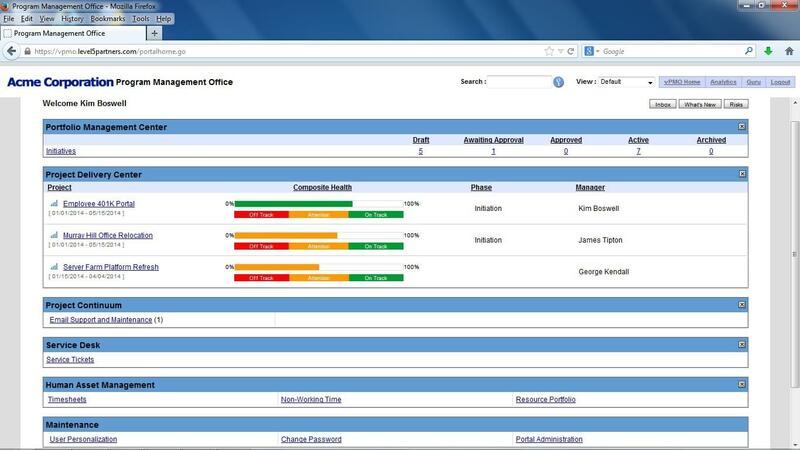 The Virtual Program Management Office (vPMO) suite, developed by L5P, gives organizations the tools to improve current project management practices. This project management solution offers components for every stage of the project delivery life-cycle including the Portfolio Management Center (PMC), the Project Delivery Center (PDC), the Human Asset Management (HAM),the Service Desk, and the GURU Center. The PMC is a tool that evaluates, prioritizes, and approves of new project initiatives to help merge them with existing business strategies. The PDC is an end-to-end project repository that oversees project coordination, team collaboration, and system design. The HAM is a vPMO component that identifies the best resources for each project role. The resources included in this area are resource workload, time and effort tracking, resources available, and resource analysis and forecasting. The Service Desk provides help desk functionality such as reporting and resolution of incidents. The Guru Center is a knowledge management functionality that was designed to help businesses share project knowledge, templates, samples, and more. With its 24/7 mobile capabilities for teams, vPMO saves time and improves service. Using real-world best practices and industry knowledge, L5P aims to solve problems, reduce risk, and promote continuous project delivery improvement for businesses of all sizes. Learn everything you need to know about Level 5 Partners vPMO. Our experts will reach out to you shortly.